BOSTON – On Saturday afternoon, a season that seemed destined for so much more came to an abrupt end in the opening round of the NCAA Tournament in front of a record-breaking crowd of 1,401 fans, the most ever in attendance at Matthews Arena for a women’s college hockey game. Gillis Frechette’s breakaway goal at 5:19 of overtime gave the Cornell Big Red a 3-2 win, and denied the Northeastern Huskies their elusive first trip to the Frozen Four in program history. That end seemed nearer than most had anticipated with the unexpected news prior to the game that Huskies first line center Alina Mueller wouldn’t be playing. 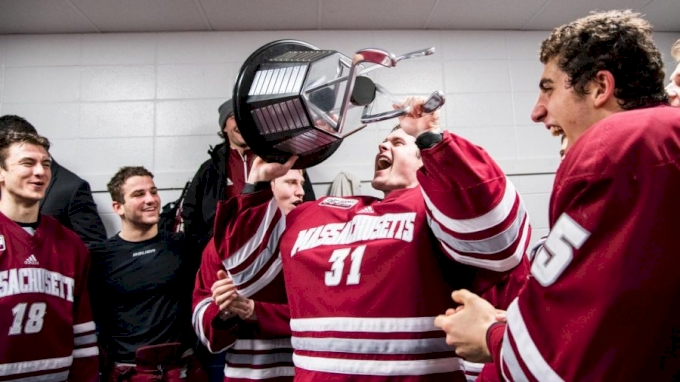 Flint revealed after the loss that it was a broken right hand, suffered during the Hockey East semifinals, that kept his star player out. Flint didn’t make excuses after the game, but not having Mueller, who tied for the team lead in goals with 21 and had the most points with 51, clearly had a significant impact on the group. It didn’t play out that way early on, however. The Huskies found themselves in a 2-0 hole after the horn sounded to end the first period. Big Red junior Kristin O’Neill curled all the way from the bottom of the right circle to the left, and her shot was tipped home past Northeastern netminder Aerin Frankel by Amy Curlew at the 13:28 mark to open the scoring. Cornell junior Grace Graham followed that with a power-play goal with just 32 seconds left in the opening frame, again on a deflection, to double the Big Red’s lead. But, the same resiliency that the Huskies showed all season long finally made an appearance in the third period. Veronika Pettey scored an extraordinary, diving goal to finally beat Cornell goaltender Marlene Boissonnault at 9:28 of the third period and Skylar Fontaine’s goal off the rush through a defender just under five minutes later tied the game and sent Matthews Arena into a frenzy. A win, however, simply just wasn’t to be. “I remember coming down the middle of the ice, and Diana Buckley had the puck, and I looked up and there was no defense in front of me, so I just started screaming for the puck,” Frechette said. She didn’t miss it. For such a tightly-played game, for anyone to have that much time and space, especially in that situation, was shocking. For this year’s Huskies team, there will be no more chances. But, Flint is hopeful that this group set the stage for future success of others down the line.